Biot problem - deformable porous medium with a no-penetration boundary condition imposed in the weak sense on a boundary region, using the short syntax of keywords. The Biot coefficient tensor is non-symmetric. The mesh resolution can be changed by editing the shape variable. ‘direct’ (a direct solver from SciPy), ‘iterative-s’ (an iterative solver from SciPy), ‘iterative-p’ (an iterative solver from PETSc) solvers can be used as the main linear solver. 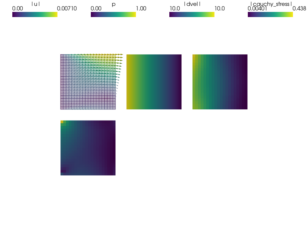 ‘direct’ , ‘cg-s’ (several iterations of CG from SciPy), ‘cg-p’ (several iterations of CG from PETSc), ‘pyamg’ (an algebraic multigrid solver) solvers can be used as preconditioners for the matrix blocks on the diagonal. See setup_precond() and try to modify it. python simple.py examples/multi_physics/biot_short_syntax.py -O "ls='iterative-p'"
to monitor the PETSc iterative solver convergence. It will diverge without preconditioning, see matvec_bj(), matvec_j() for further details. The PETSc options can also be set in the solver configuration - try uncommenting the 'ksp_*' or 'pc_*' parameters in 'iterative-p'. Uncommenting all the lines leads to, among other things, using the GMRES method with no preconditioning and the condition number estimate computation. Compare the condition number estimates with and without a preconditioning (try, for example, using 'precond' : 'mg' or 'pc_type' : 'mg'). resolution can be changed by editing the `shape` variable. used as the main linear solver. solvers can be used as preconditioners for the matrix blocks on the diagonal. See :func:`setup_precond()` and try to modify it. uncommenting the ``'ksp_*'`` or ``'pc_*'`` parameters in ``'iterative-p'``. example, using ``'precond' : 'mg'`` or ``'pc_type' : 'mg'``). Compute derived quantities of interest..
# Mesh resolution: increase to improve accuracy. Setup a preconditioner for `mtx`. # Get active DOF indices for u, p.
# Get the diagonal blocks of the linear system matrix. # solver for each block could be used. The application of the Block Jacobi preconditioner. The application of the Jacobi (diagonal) preconditioner. # Create the preconditioner, using one of matvec_bj() or matvec_j(). # 'ksp_type' : 'gmres', # Overrides `method`. # 'pc_type' : 'none', # Overrides `precond`.